WHY talk to a lawyer? Cyclists are sometimes their own worst enemies on the roadway. While most cyclists diligently follow the rules of the road out of both courtesy and self-interest for their own safety, some riders are less careful. Unfortunately, those riders often create a bad reputation for all cyclists. It is also true that some motorists have little tolerance for cyclists, either because of a misunderstanding of cyclists’ rights or out of impatience. Motorists occasionally complain to local police departments, particularly when encountering group rides, cyclists riding too close to the center line, or riders ignoring traffic signals. 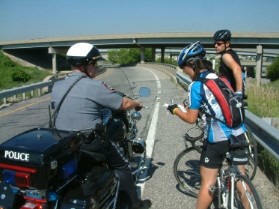 From the perspective of cyclists, police officers occasionally overreact to complaints. Don’t invite complaints. The most common legitimate criticism of cyclists involves riding near the middle of the roadway or blatantly disregarding traffic signals, particularly when vehicles are in the area. Avoid making these mistakes. If stopped, never argue with an officer. When issuing a ticket, the officer issuing the citation records an assessment of the violator’s demeanor. If the driver or cyclist is rude, disrespectful or argumentative, the information will be conveyed to the prosecuting attorney. Obtaining a dismissal or negotiating a resolution of the citation is more difficult when the citation reflects aggression toward the officer than if the report is that the cyclist was polite and respectful. Give yourself or your attorney a chance by staying in control. In addition, showing respect to the officer may result in his or her decision to simply issue a warning instead of a ticket. If asked, always give your proper name, address and telephone number. Providing false information to a police officer can result in penalties far more serious than those associated with the traffic violation. Obtain the names, addresses and telephone numbers of any witnesses that you feel may be able to support your description of the incident. You can find more information in our FAQ page. Otherwise, please feel free to send us a message. Or you can give us a call at (414) 352-0900 and we’ll talk you through it. PRIVACY STATEMENT - This is an Information Only Website. This site does not collect, retrieve, store, or otherwise maintain any personal data from visitors.